Canoe Island French Camp is accredited by the American Camp Association, whose representatives visit the camp every three years to score the camp on more than 200 standards for health, safety, and program quality. As a leading authority in child development, ACA works to preserve, promote, and improve the camp experience. The ACA’s website for parents and Camp E-news reach nearly 1 million parents each issue and focus on the camp as an integral educational experience. We encourage parents to visit the website and sign up for ACA newsletter to receive current information on the camp experience. If you have questions on the benefits of camp, how to prepare your child for camp, or talking about the possibility of homesickness before leaving for camp, this is the place to find answers from child development experts. Does my child have to know how to speak French to come to camp? Our program is designed to give those with little French exposure a fun experience with language and culture to encourage them to continue studying French. At the same time, moyens and avancés French students can continue their language acquisition over the summer with French fluent counselors/instructors. Campers are interviewed on the first day as to their language skill level and are placed in French class with 5-6 other campers at the same level. French is used all day long in activities, announcements, songs, French class and evening games. Campers are not required to use French during meals nor free time and we make sure beginners understand all safety briefings and announcements. How do the children get to camp? Most campers walk on the Orcas Island ferry at the Anacortes Ferry Terminal about 80 miles north of Seattle. Our counselors and boat captain meet them at the Orcas Island ferry landing and help them onto the Ferry Queen, Canoe island’s 27′ Raider for the 15-minute ride to Canoe Island. Some arrive on Orcas Island with their parents, others walk on the ferry unaccompanied. Those from outside northern Washington often fly to SeaTac International Airport where a staff member will meet them and accompany them on BellAir Airporter Shuttle to the Anacortes ferry terminal, about a 3 hour trip. Flight arrivals should be by noon on the first day, departure flights should depart after 3:30 pm on the last day but before 6 pm. More information is at Getting to Camp. This chaperoned service costs $75 each way, which pays for the camper’s and counselor’s shuttle and ferry tickets. All staff participate in at least six days of training on pool, waterfront and island safety; first aid; emergency response; working effectively with children; and teaching French effectively. They are also oriented to the camp activities and trained in their activity leadership role. All our staff are hired for their maturity, experience, French language ability, leadership skills and great personalities. Our counselors are at least 18, have had at least one year of college and are conversant, if not fluent, in French. At least half of the counselors come from France or other Francophone countries, which helps give the camp a French atmosphere. Our supervision ratio of counselors to campers is 1:5, and additional responsible staff are a part of each session: the camp nurse, camp directors, cooks, kitchen assistants and camp caretakers. Tipis have 5 campers to one counselor. Many activities are limited to 6 participants. Do all the campers come with a friend? Most children coming to camp for the first time do not come with a friend, but they leave camp with many new friends. Significant effort is made during the first hours and days at camp to ensure that all campers connect with each other, learn names and become familiar with the group they are living with. Campers coming with one friend are typically allowed to bunk with that person, however, groups of friends will be split up in pairs so that they are encouraged to make new friends. How will my child get the medicine he needs to take? Our registered nurse will meet with each camper when he or she arrives, review health forms and collect medications, including analgesics and vitamins. Campers who need inhalers and epi-pens for severe allergies may carry them under counselor supervision. If you need to make a change to the health history information you filled out on your child, please contact us at info@canoeisland.org and we will email you medical information addition form to fill out and return with updated information. What other medical care is available? Our registered nurses will treat campers for minor cuts and scrapes, as well as colds or upset stomachs. Our camp director and executive director have been trained as Wilderness First Responders and lifeguards. Paramedic services and physician-staffed medical clinics and Peace Health Hospital in Friday Harbor are available within 20 minutes by boat, and medivac helicopters can reach mainland hospitals from the Canoe Island in 20 minutes. My child has special dietary needs. Is that a problem? All of our meals include balanced vegetarian options and are served family style. We accommodate food allergies with careful handling procedures. Parents should include on the Camper Information form as many details about a food allergy, intolerance or restriction as possible so that our chefs can understand what will be best for their child. 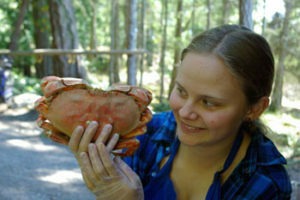 Multiple allergies (eggs, dairy, fish, and soy, for example) and vegan diets are hard to accommodate; please reach out to Margaret Schafer, camp director, at campdirector@canoeisland.org or 360.468.2329 to discuss vegan diets or multiple food allergies. How will I know what clothes and equipment to send with my child? A packing list can be found at Preparing for Camp.